Boyz II Men will join country stars Rascal Flatts to perform at Music for Champions, a memorable concert event supporting the battle against cancer. The first-ever Music for Champions concert will take place on Monday, March 19, 2012 at Hard Rock Live Orlando. Proceeds from the concert will jointly benefit Arnold Palmer Hospital For Children and TJ Martell Foundation for Leukemia, Cancer and AIDS Research. 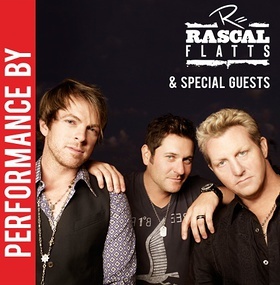 The concert will kick off the 2012 Arnold Palmer Invitational Presented by MasterCard. The concert will begin at 7:30 P.M., with doors opening to general ticket holders at 6:30 P.M. Tickets start at $50, and went on sale Friday, February 3 at 10:00 P.M. EST. Concert, ticket, and sponsorship information is available at www.MusicForChampions.com. For more information, please contact the T.J. Martell Foundation at (646) 841-1394 or visit www.TJMartellFoundation.org. In just over two decades, Arnold Palmer Hospital for Children has risen from a community hospital serving Central Florida to an internationally-known health care institution, now ranked as one of the country’s “Best Children’s Hospitals” by U.S. News & World Report. Arnold Palmer Hospital partners with MD Anderson Cancer Center Orlando to provide highly focused expertise and individual attention to critically ill children from around the state of Florida. Since 1995, their pediatric oncology and hematology doctors have cared for children diagnosed with a variety of cancer and blood disorders, including leukemia, central nervous system cancers, bone tumors, Hodgkin’s Disease, lymphoma, sickle cell disease and hemophilia. Increasingly, their clinicians are joining forces with researchers around the country and in Orlando to perform research and develop innovative cancer treatments and protocols. Arnold Palmer Hospital for Children is committed to the ongoing process of discovery and innovation and proud to be the newest member of the T.J. Martell Foundation family. Founded in 1975, the T. J. Martell Foundation is the music industry’s largest foundation that funds innovative medical research focused on finding cures for leukemia, cancer and AIDS. The Foundation supports creative early-stage research projects aimed at developing more effective clinical treatments for patients, which otherwise might not be funded. The Foundation began with a promise music industry executive Tony Martell made to his son, T.J. who was diagnosed with leukemia in 1973. T.J. asked his father to raise a million dollars so no one else would have to experience suffering as he did; his father agreed. Two years later, T.J. died and Tony honored his promise to his beloved son. A fundraising event in T.J.’s memory raised $50,000 towards that promise. With the help of friends in the music industry, Tony Martell founded the T.J. Martell Foundation for Leukemia, Cancer and AIDS research in 1975. Since then, the Foundation has raised over $250 million. In 2012 the Foundation will fund research projects at 11 institutions around the country including Arnold Palmer Hospital for Children.